Pilates is a method of body conditioning that strengthens and tones muscles. Pilates focuses on the core postural muscles which help keep the body balanced and which are essential to providing support for the spine. In particular, Pilates exercises teach awareness of breath and alignment of the spine, and aim to strengthen the deep torso muscles. The Pilates Method was designed to develop the body in a uniform manner, with special attention paid to alignment, posture and balanced muscle development/flexibility. This approach provides students with a body that feels more fluid and can move with ease. And because of this, Pilates is loved by men and women of all ages and abilities. It can challenge the strongest athlete, or be used to recover from an injury. Pilates is the most versatile and customizable form of exercise that makes it the perfect fit for virtually every BODY out there. Joseph H. Pilates developed this method in the 1920’s. As a nurse in Great Britain during World War I, he designed exercise methods and equipment for immobilized patients and soldiers by attaching springs to their beds so that they could rehabilitate. Later, these ideas transformed to what is now known as the Reformer and Cadillac pieces of equipment . In addition to his equipment, Pilates developed a series of mat exercises that focus on the torso. He based these on various exercise methods from around the world, including yoga and Chinese martial arts. Pilates called his method Contrology, because he believed his method uses the mind to control the muscles. 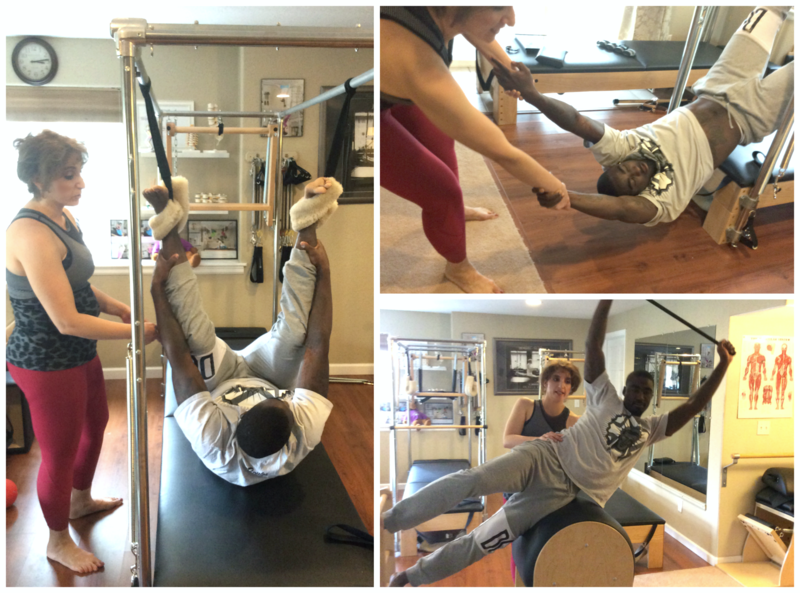 Magda teaches Super Bowl Champion 50 Kayvon Webster, cornerback of the Denver Broncos (2013-2016). Magda introduced Kayvon to several foot corrector exercises that helped him ankle stay injury-free during his seasons with the Broncos. Pilates is a mind-body method of body conditioning that requires full concentration and attention to the most subtle movements imaginable. Always challenging and never boring, there are hundreds of exercises to learn using several different pieces of equipment. New students begin learning Pilates at a slower or more moderate pace so they can build the skills in the body to do the exercises correctly. Hands on assistance is also used as needed with newer clients to facilitate the learning process. 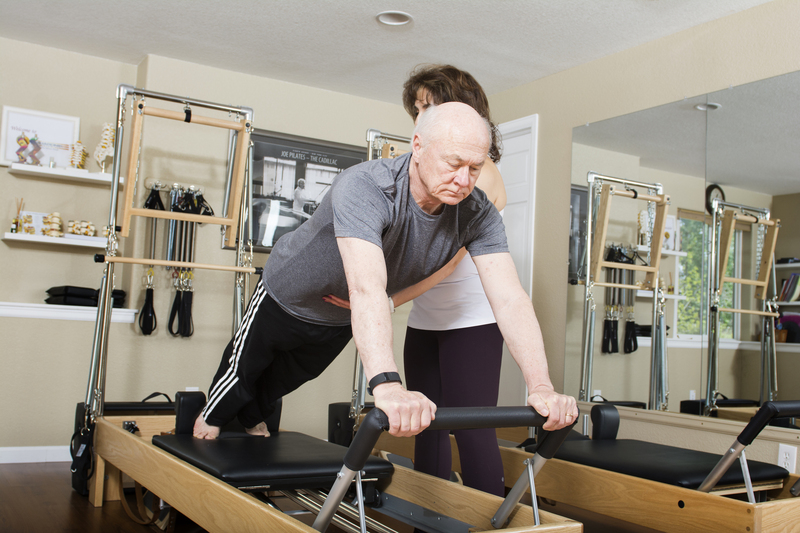 Then as students progress, the pace quickens as Joseph Pilates designed the mat and reformer sequences so that they could be performed at a certain tempo to facilitate efficient movement. When Pilates is done in its full sequence, rhythm and tempo, the heart rate will rise and students will enjoy a challenging full-body workout. Yet, Pilates never leaves your body feeling beat-up, only strong, flexible and rejuvenated! The Pilates Method was designed by Joseph H. Pilates to be practiced on the mat and a full complement of equipment and accessories including the Cadillac, Wunda Chair, High "Electric Chair," Spine Corrector, Ladder Barrel and Ped-o-Pul. Joseph Pilates first created the Mat workout to benefit himself as he was plagued with health issues as child. When Joseph was an intern and nurse in World War1, he wanted to help the infirmed soldiers to rehabilitate themselves so he attached springs to their bed posts so he could get them to move impaired limbs in ranges that could not otherwise be achieved. This would restore joint functionality and muscular strength and thus, re-educating the body. This set the foundation for his collection of equipment (also referred to as apparatus), each with a unique design and benefit. The Cadillac is used to work various asymmetries in the body. Because each arm or leg is usually attached to a spring, the body is forced to work more evenly and thus, not let the dominate side of the body take over. The (Universal) Reformer is the most famously known apparatus that offers a very well rounded workout design to uniformly develop the body. The Wunda Chair is very challenging to a person's balance and strength. And the Barrels are designed to open the shoulders and hips. 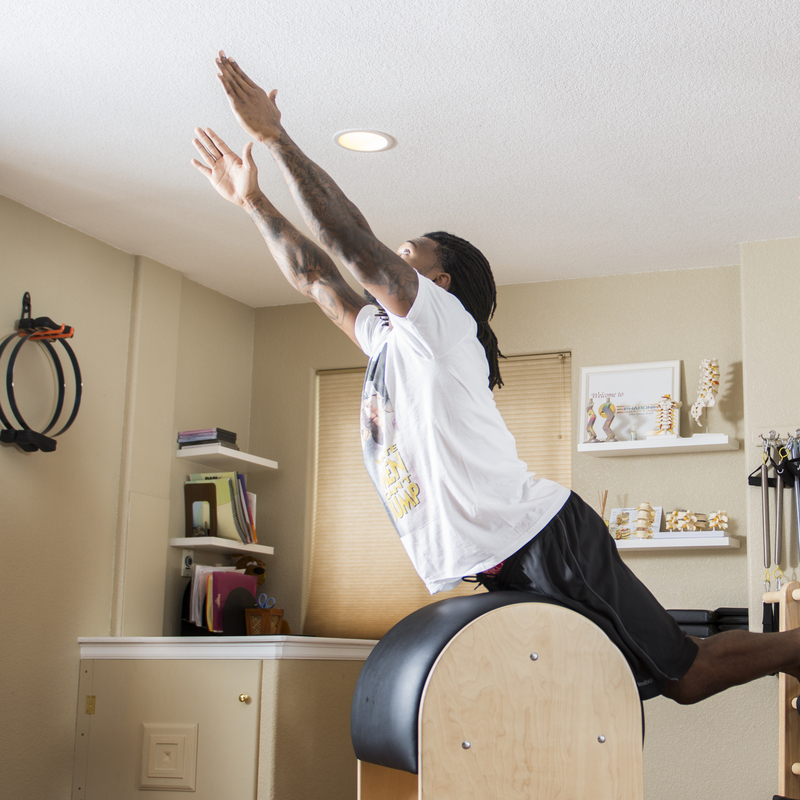 Many Pilates exercises can be practiced across several different pieces of equipment for different experiences and benefits. The legs are supported but a greater range of motion in the shoulders is required while the springs and push-through bar guide the spine into extension. Requires a lot of hamstring and gluteal engagement and allows the student to achieve greater range of motion in the spinal extensors as well as the hips. The springs assist the upper body up into extension but there is little support for the lower body so more lower body muscle engagement is needed. After all these skills are practiced and achieved on the apparatus, the full Swan Dive can be performed in the mat work.